Photo measuring 5 x 4 inches. 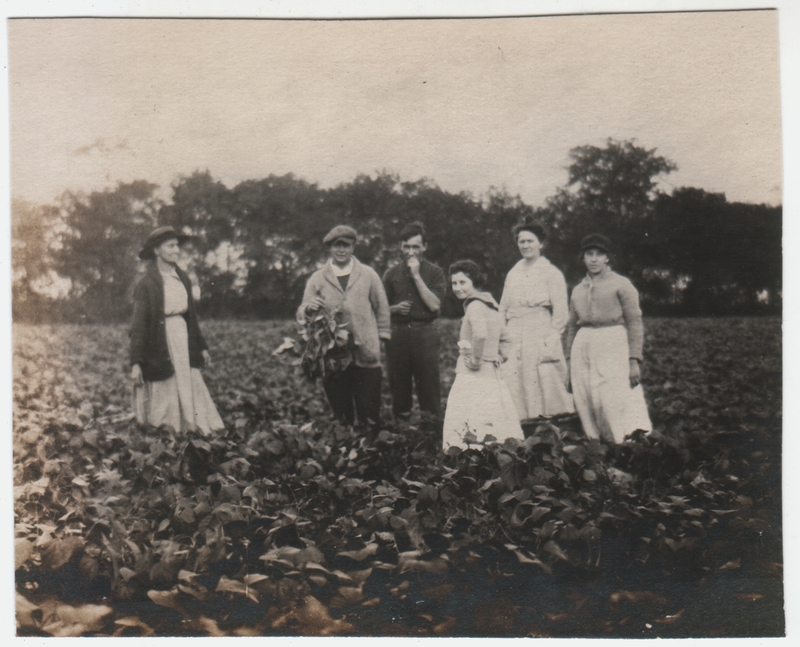 I know nothing about this photo, of course, but my guess would be that this is a farming family out examining the state of their crop. The man is holding up a sample, and there are enough smiles that I suspect they are pleased. I don’t know if they are ready to harvest, partly because I don’t know what the plant is. Beans? Tobacco? Perhaps one of my more plant-savvy readers can tell me. It doesn’t help that the photo is slightly out of focus, but then, I think the image’s slight blur gives it a sort of romantic through-the-mists-of-time quality, looking at it all these years later. What a great photo; I don’t think I’ve ever seen such a casual snap of farm life, especially when it appears to be taken by one of themselves, and not a visitor from the WPA’s photo survey. From the clothing/hairstyles, I would date this as early to mid-twenties, if that helps any. Glad you like it! Yes, I figured it was unusual enough (at least to me) that it was worth posting even though it’s a bit out of focus and damaged. The clothing and hairstyles suggested about the same time period to me, too. For some reason I’m getting a European vibe from it, though I can’t quite put my finger on it. Also, I’m struck by the way some of them seem bundled up against chilly weather, as if they are out in the very early morning, or not at the height of summer.